15 Weird, Abandoned Places to Explore – These are US-centric, but neat. Burrow Afghan – Crocheted afghan inspired by Mrs. Weasley. My Little Gargoyle – Knitting pattern for a winsome li’l gargoyle. 11 Books That Scared the Master of Horror, Stephen King – King discusses some novels that scared him. Cthulhu in the House – A new board game featuring artwork depicting the most adorable little Old Ones you’ve ever seen. Garthim Cosplay – An amazing Dark Crystal-inspired costume. Fevre Dream – A vampire novel by George R.R. Martin. There’s a review here. This Supercut Will Make You Jump – A collection of 40 jump scares. What? I said I’d still post occasionally. Bats in the Night Sky Beanie – Knitting pattern for a hat featuring a bat. Someone is Making Clothes From Lab-Grown Alexander McQueen Skin – Designer Tina Gorjanc is making vat-grown “human leather” clothing. Memento Mori Watches – If you can afford a Swiss watch, these skull-shaped beauties are ideal. Strange Stories and Stranger Things – Atlas Obscura has teamed with Netflix to do a “truth is stranger than fiction” streaming web series. I donate blood… – This is a really excellent reason to donate blood. Bride of Frankenstein Hoop – Cute felt-and-embroidery retro Bride decoration. So! I started this silly blog clear back in 2007, as a way to share my love of gothy weirdness with the world. Because I am an idiot I made it a personal goal to update without fail every single weekday, and although I’ve actually managed that for over nine years(!!!) I have to admit that things have been limping a bit of late. It’s time, I think, to pack it in. I’ll probably still post occasionally–keep me in your RSS feeds (are those still a thing? )–but it’ll be sporadic. My archive, of course, will stay up for as long as I can pay the bills. Thanks to all of the commenters who’ve encouraged me over the years. You’re welcome to look me up on Facebook; I’m still weird over there. Nightmare Before Christmas – This fan art by NENEBUBBLEELOVER is great cosplay inspiration. Blood Red Lipstick – Replica of a color from 1922. Kenku Cosplay – This costume of a raven-like D&D character is astonishingly detailed. From the Library of the Evil Orchid – Great collection of creepy bookplates. Beetle – Steampunk filigree Volkswagen by metal art shop Vrbanus. Annie Aube – Needle artist whose work includes a series of scenes from particularly gruesome fairy tales and myths. The 7 Most Ridiculous Ghost Stories from Around the World – An amusing roundup. Darkfin Gloves – Gloves that give you “webbed fingers” which supposedly improve your swimming. I don’t care about that; I just want a pair to wear around and make people nervous. Next Time You’ll Know Better – This take on vampires is awesome. Handbook for the Recently Deceased – If you want to troll a friend in this fashion, you can actually purchase a book with this cover. Plush Jumping Spider – Squishable has a rotund Rainbow Jumping Spider, ready for cuddles. Moody Voodies – Etsy shop specializing in creepy voodoo-type dolls. I love the Wednesday Addams one. Madagascar Hissing Cockroach Cake – Wonderfully lifelike cake that about 50 people sent me links to, because my friends understand me. Fairy Catching Kit – Cute “habitat” for catching one’s own fairy. It’d be reasonably easy to DIY something similar. Digitised Manuscripts – The British Library has a huge collection of scans from old manuscripts, such as this Medieval book of hours. Steotch – A variety of entertaining cross-stitch pieces. Spider Ribbon Snap Clip – This would be cute with a ribbon rose as the body rather than plain looped ribbon. Labyrinth Funko Figures – The Sarah figure includes the ‘ello worm. It is to squee. Skeleton Banner Pattern – Free knitting pattern for a skeletal torso. Creepy Phone Cases – These phone cases with teeth and eyeballs are creepy as hell. Oldschool Gothic – Gallery of 80s goth and deathrock fashion. Edgar Allan Poe Wedding – Some lovely details. Haunted Memory Box – Instructions for making and decorating a ridiculously cute little box for spooky mementos. Chaithulhu – Portrait of Cthulhu as a prim and proper Victorian lady, taking tea. Because why not. Urban Fairies – Site which collects “sightings” of fairy doors. 9 Ridiculously Creepy Medical Museums Open to the Public – Road trip! Just Your Typical Office – Gorgeous steampunk-themed office makeover. Brutal Bunnies – So much Medieval illustration was just completely bananas. “Working” Vortex Manipulator – This little wrist-mounted computer has some great steampunky overtones. Witch Tattoo Art – Some stunning work. Ghost Babies – Interesting article about Victorian postmortem photography. Bears – Every cryptozoological mystery solved. Life After Death Designs – Etsy shop full of neat coffin-shaped items like clocks and makeup holders. 12 Ways To Have The Witchiest Vacation Ever – I hate BuzzFeed lists and their gratuitous gifs, but if you can get past that there are some interesting ideas for vacationing in New Orleans. 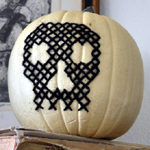 Deathflake – Free knitting pattern for a snowflake design featuring a skull in the middle. This may be the most metal name for a pattern I’ve ever heard of. It’s time once again to clean out the ol’ drafts folder. Buckle up. WWII Era Vampires – This is a great hook for a story. DIY Fox Tail – Tutorial for making a cosplay fox tail out of yarn. Coffin Beach Towel – Black beach towel shaped like a toe-pincher coffin. You could probably DIY one of your own with an oversize towel and a pair of scissors. To the Surface – Photo series of period dresses posed as ghostly figures. Amigurumi Monsters – A whole bunch of crocheted baby monsters. I particularly like how so many different “personalities” can be created by using the same base body plan and just changing the details. Fairy Berries – LED lights that fade in and out like fireflies. Pretty landscaping detail for parties. Is the Person Naming These Colors of Yarn Okay? – I agree that “Rotten pistachio cream macaron” and “Too much Aperol Spritz” are fairly unique color descriptions, but there’s also “Poisoned blood,” “Rain in a graveyard,” and “Bats in a dark mood,” which I’d buy just for the names alone. This to That – Choose the two things you’re trying to glue together, and the site tells you which glue will work best. 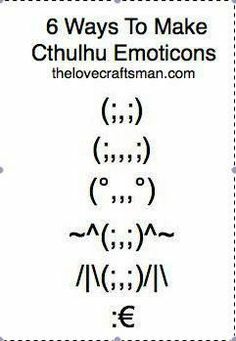 Handy for crafters. Whoops I think I broke it… – Small collection of tutorials for making props (with entertaining photo captions). I particularly like the Thing in a Jar. Demon Daycare – Site which allows you to “drop off” your personal demons for a while. Seymour’s Custom Doll House – Rather sparsely furnished but lovingly detailed spooky mansion. Vampire Lore – This made me giggle. Rachnera Cosplay – NSFW-ish. It’s a shame the spider body isn’t robotic, but even just standing still it’s pretty amazing. Weta – Igunamouth takes a look at one of my favorite bugs. 12 Killer Facts About Shaun of the Dead – A roundup. Catherine, Called Birdy – Fictional diary of a 14-year-old girl in the year 1290. Good read for kids in the 10-12 age range.